Summer tomatoes don’t really need much help in the flavor department, and right now, there are DOZENS of varieties of tomatoes, including gorgeous heirlooms. Beauties like these stand alone in a salad just fine, with a bit of basil and sea salt. But to add a layer of sweetness and luscious fleshy mouth feel, peaches are an interesting pairing to the acidity of the tomatoes, and are equally highlighted by the basil. 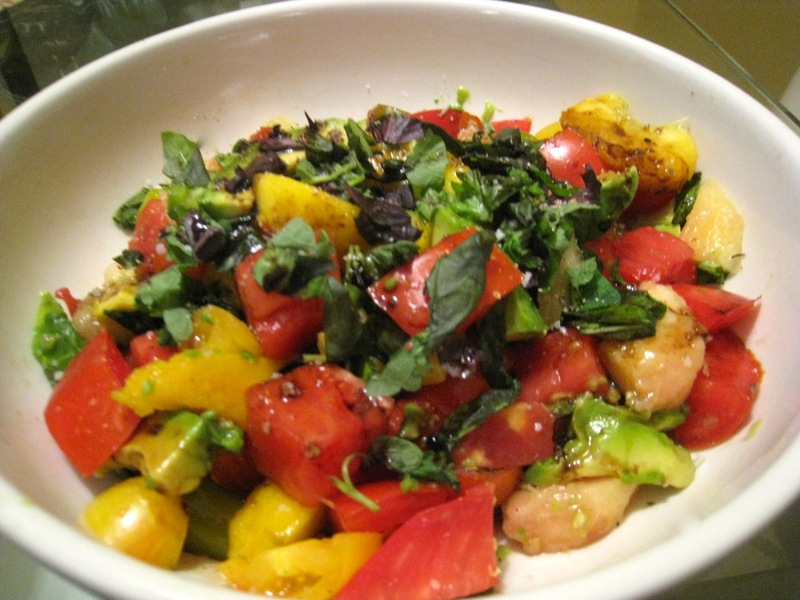 Drizzle with aged balsamic vinegar and serve. For even more substance, add a half an avocado, and the salad becomes a light lunch with a bit of bread to soak up the juices. Blue cheese on tomato lovers might want to resist the temptation to tamper with the fresh flavor of the salad with overkill, but it certainly won’t ruin it if you must indulge. But this recipe leaves off the cheese in favor of a pure summer fruit flavor. 1. Place first five ingredients in a large bowl and toss to combine. 2. Portion the salad on 4 plates. Drizzle with aged balsamic and sprinkle with sea salt and black pepper.